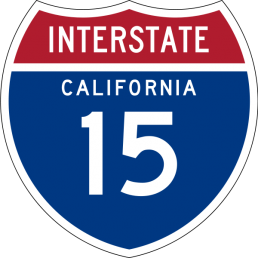 The California Transportation Commission (CTC) Wednesday approved $50 million in state funding to the Riverside County Transportation Commission (RCTC) to begin environmental studies to extend the Interstate 15 Express Lanes from Cajalco Road in Corona to State Route 74 in Lake Elsinore. The State Transportation Improvement Program (STIP) funds will allow an Environmental Impact Report/Environmental Impact Statement to be prepared for this proposed new 15-mile segment. Construction is under way now on a 15-mile segment of the I-15 Express Lanes from Cajalco Road to State Route 60. The $50 million set-aside for I-15 Wednesday is contingent upon California’s recently-enacted gas tax remaining in place. Currently, efforts are underway to qualify an initiative to repeal the tax. RCTC will wait until the fate of the tax is known before issuing a contract to begin work on this project. Interstate 15 French Valley Parkway Interchange, Temecula, $47.6 million. Funding in the amount of $32 million had been removed in the 2016 State Transportation Improvement Program, due to reduced revenue projections at the state level. New gasoline tax revenue has allowed these funds to be reinstated so the project can move forward. Interstate 15 Railroad Canyon Interchange, Lake Elsinore, $2.9 million. Programming funds for new projects was disallowed in the 2016 STIP due to reduced revenue. This approval reinstates the 2016 funding commitment and will allow construction to start in the near future. RCTC is also seeking competitive dollars from state gas taxes to secure all necessary funds to complete this critical project for the City of Lake Elsinore. CV Link, Coachella Valley, $20.6 million. The CV Link Project is a planned 40-mile active and alternative transportation pathway for pedestrians, bicyclists and low-speed electric vehicles that runs parallel to Highway 111. The first segment of CV Link opened in February. Avenue 66 Grade Separation Project, Mecca, $6.13 million. The Avenue 66 project will separate Union Pacific freight trains from roadway motorists by building a two-lane bypass road over the railroad tracks.